You can apply for a provisional licence up to three months before your 17th birthday.Then once you are 17 you can start driving a car legally on public roads. If you receive Disability Living Allowance at the higher rate, you can begin taking driving lessons on your 16th birthday. Remember you can only be accompanied on the road by someone who is at least 21 years old and has passed their test for 3 years or longer. You can even start practising your driving on private land. Be careful not to confuse private car parks as private land. They are classed as public roads so don't use these without a provisional licence. Remember to check your eyesight wearing glasses or lenses as normal and make sure that you can read a standard car number plate from 20 metres away. (Learning to drive in Birmingham and the surrounding areas can be a scary experience, especially within rush hour. It's important to get lessons from a qualified driving instructor before you head out in the roads). Before you start learning to drive, you'll need a provisional driving licence. Get the ball rolling early and apply for your provisional licence 3 months before your 17th birthday. 1. You can pick up an application form (called the D1 form) from a Post Office or online from the DVLA website. 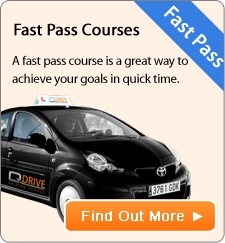 You can get more information on How to drive in UK with a Foreign Licence. For people with disabilities, driving can be a daunting process.However there are specialist services that are tailored to deliver driving for disabled people. QDrive has also helped many learners with disabilities to teach them to drive safely.